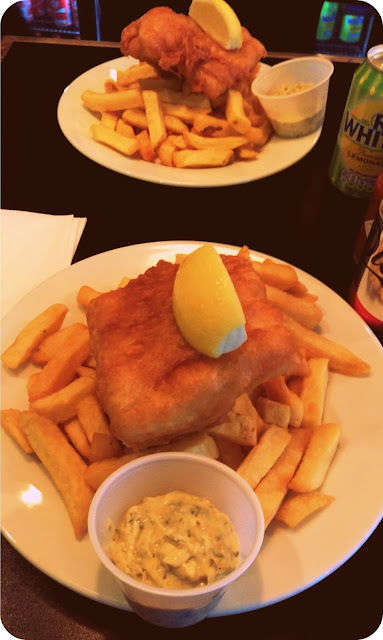 When I think of British food, one of the first things that pops into my head is fish & chips. 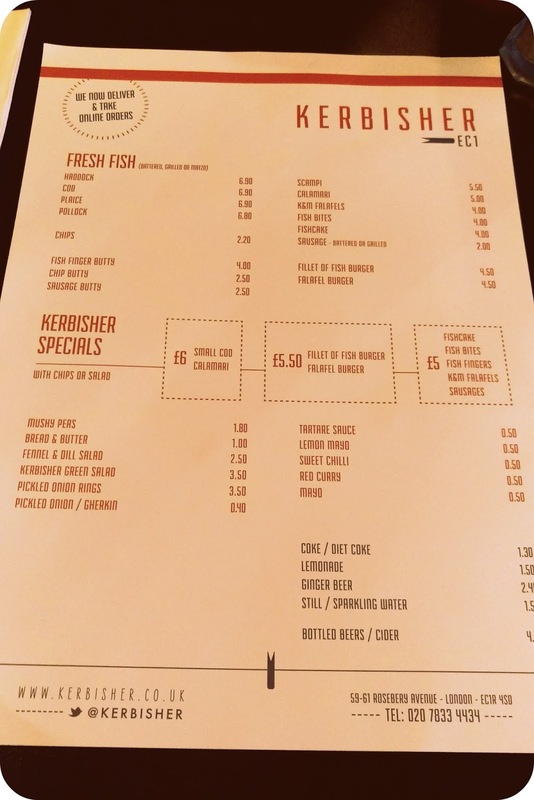 On the hunt for London’s best chippy, T and I came across Kerbisher and Malt. I had no idea what would be in store but when we got there I was pleasantly surprised. The contemporary chippy is a little bit more than the average greasy takeaway. It gives you more of a dining experience. You give your order to the waiter who will then bring you your food. You pay after you eat your meal. Definitely not just another chip shop. The EC1 restaurant, yes I am calling it a restaurant, is very small, and seats 6 people at a large table in the centre and there’s also a few window seats but that doesn’t take away from the fact that they’ve used the space brilliantly. 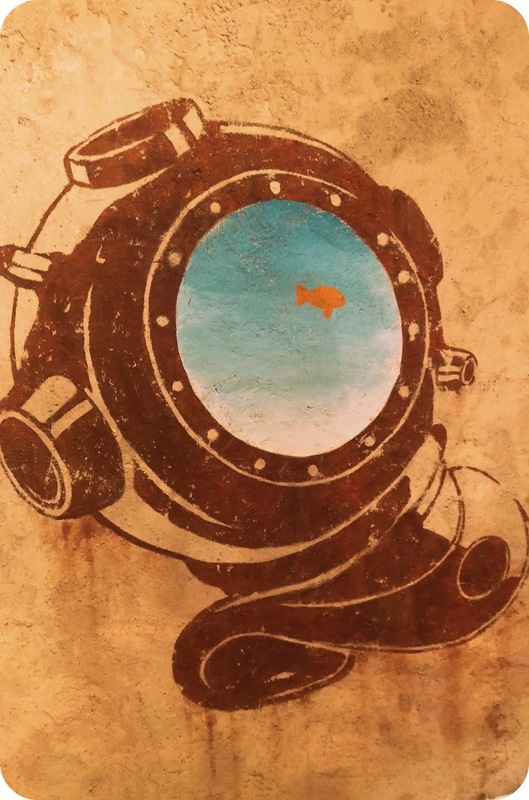 They’ve decorated the place using metro tiles with an uncovered exposed cement look, finishing it all off with a big stenciled picture of a diving helmet on one of the walls. There’s no grease or grime in sight and there’s even cutlery and condiments on the table. Looking at the menu I was really glad that they serve fish and chips and all the things associated with it and that’s it. There’s no other irrelevant things on the menu. They know what they’re good at and so why fix what isn’t broken, right? What’s even better is that you can have your fish battered, grilled or matzo – which is basically breaded. If you’re a vegetarian, they offer falafel’s and even they’re drinks are basic cans that you’d expect in a chip shop. I opted for battered cod with chips and I was pleasantly surprised at both how quickly the food came out and how nicely it was presented for ‘just a chip shop’. I’m not one for sides and sauces but it was great to know that all of them (except for ketchup) were made by hand. I decided to go all out and try the tartare sauce and it was delicious! None of that full of preservatives crap. The fish was delicious, soft and flaky and literally melted in my mouth. The chips are hand made and double fried to ensure they’re cooked to perfection. As expected the price was double that of a usual chip shop, but let’s face it, you’re paying for a service and it’s definitely worth it. I’m so glad that they’ve now opened their 5th branch in EC1 and I really do hope that their success continues and inspires more crossovers between takeaways and restaurants. In fact, I’m really hoping one opens nearer to me in East London. Mostly because I know that I was so impressed that once it opens, I’m definitely not going to be going anywhere else to get my fish & chips. I’d definitely recommend you all to try out Kerbisher when you’re near one.